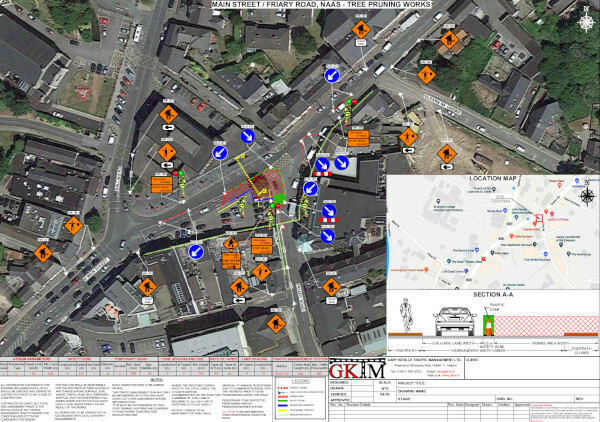 Traffic Management Plans Design & Consultancy - GKTM Ltd.
A Traffic Management Plan maximises the safety of the workforce and the travelling public, ensures traffic flows as freely as possible and that the impact of the road works is kept to a minimum. 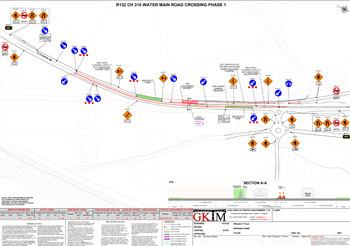 GKTM produce Traffic Management plans for long or short term schemes. From simple lane closures to multiphase crossover schemes, our traffic management plans will ensure safety and efficiency for site personnel, motorists and the general public. The type of TM plan that we provide will depend on whether the roadworks are Type A, B or C.
Roadworks that are of a short duration and involve the use of one or two vehicles, typically maintenance to utilities or street furniture, in all visibility conditions, when the expected traffic flow is less than the available carriageway capacity or the works do not reduce the carriageway width significantly. Typically Type C Works can be generic drawings which are sufficient for crews who are suitably qualified and experienced to set up TM. GKTM have sets of generic drawings for all Type C Set Ups which can be bought off the shelf in a variety of packages. Part-time roadworks that remain in operation when the expected traffic flow is less than the available carriageway capacity. With this type of works, the roadworks are such that they can be removed if necessary to minimise potential traffic delays. These traffic management plans relate to common scenarios and setups. We add basic project information to TM generic drawings and adapt them to site specific conditions. The turn around on these drawings can be fairly quick. However, we would ask that 1 weeks notice be given to enable us to carry out a site survey beforehand. 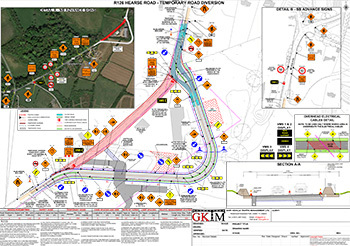 Our traffic management drawings for type A roadworks are site specific, drawn to scale and show project information in greater detail of project information. Additional time is required for the preparation of these drawings which can be produced in A3 and A1 sizes. Please note, we receive a large number of requests for this type of drawing. To ensure we give the best service, we would ask for a minimum of 2 weeks notice. Note: Roadwork Types and definitions as defined in Chapter 8 ‘Temporary Traffic Measures and Signs for Roadworks’ of the Road Traffic Signs Manual. Why Choose GKTM for your Traffic Management Plans?